(Bloomberg) -- Revlon Inc. fell sharply after warning that its delayed 10-K filing may reveal a “material weakness” in its financial reporting controls for year-end. It also reported a tough quarter, where sales slipped. On a Monday afternoon conference call, executives said the problem was caused by an issue with its SAP ERP, or enterprise resource planning, software. It estimated the cost to fix it at about $54 million. The company said it intends to file its 10-K no later than March 29 and doesn’t expect that it will result in any changes to its financial results. Still, investors appeared shaken, with shares tumbling after the news. The earnings themselves weren’t great, either. 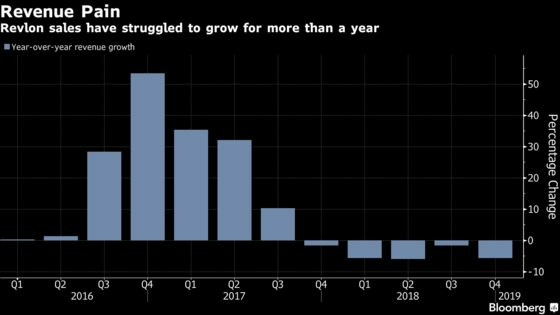 Sales dropped 5.7 percent last quarter, driven in part by the expiration of brand licenses in Revlon’s fragrance business, but offset somewhat by strength in Elizabeth Arden and China. The company has struggled to turn around its business as it fends off a growing field of competitors. Specialty beauty stores and online-only concepts have rattled the cosmetics industry. A plan announced in November to slim down bought the company some time, but now shareholders want more. Revlon also said it plans to refinance by the end of the year its $500 million of 5.75 percent senior unsecured notes due 2021, which are trading around 86 cents on the dollar, according to Trace bond trading data. The idea of a restructuring or distressed swap has been a concern among creditors, and this buys some more runway. The shares fell as much as 18 percent to $15.83 in late trading, before paring some of the losses. The stock had already sunk 23 percent this year through Monday’s close.